Are you too busy? Are you always running behind? Is your calendar loaded with more than you can possibly accomplish? Is it driving you crazy? You’re not alone. CrazyBusy–the modern phenomenon of brain overload–is a national epidemic. Without intending it or understanding how it happened, we’ve plunged ourselves into a mad rush of activity, expecting our brains to keep track of more than they comfortably or effectively can. In fact, as Attention Deficit Disorder expert and bestselling author Edward M. Hallowell, M.D., argues in this groundbreaking new book, this brain overload has reached the point where our entire society is suffering from culturally induced ADD. 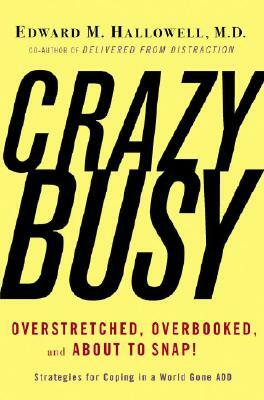 CrazyBusy is not just a by-product of high-speed, globalized modern life–it has become its defining feature. BlackBerries, cell phones, and e-mail 24/7. Longer work days, escalating demands, and higher expectations at home. It all adds up to a state of constant frenzy that is sapping us of creativity, humanity, mental well-being, and the ability to focus on what truly matters. But as Dr. Hallowell argues, being crazybusy can also be an opportunity. Just as ADD can, if properly managed, become a source of ingenuity and inspiration, so the impulse to be busy can be turned to our advantage once we get in touch with our needs and take charge of how we really want to spend our time. Through quick exercises (perfect for busy people), focused advice on everything from lifestyle to time management, and examples chosen from his extensive clinical experience, Hallowell goes step-by-step through the process of unsnarling frantic lives. With CrazyBusy, we can teach ourselves to move from the F-state–frenzied, flailing, fearful, forgetful, furious–to the C-state–cool, calm, clear, consistent, curious, courteous. Dr. Hallowell has helped more than a million readers free themselves of the distractions and compulsions of ADD. Now in CrazyBusy, he offers the same sound, sane, and accessible guidance for anyone suffering from the harried pace of modern life. If you find yourself pulled into a million different directions, here at last is the opportunity to stop being busy, start being happy, and still get things done.